You could get lost in a rabbit hole for hours on this site. Society 6 partners with hundreds of thousands of artists who upload their original work and you can get those works as art prints, on cell phone cases, t-shirts, clocks, mugs, and pretty much anything.... including pillows! Who doesn't love West Elm these days? With mid century modern all the rage, West Elm has you covered. 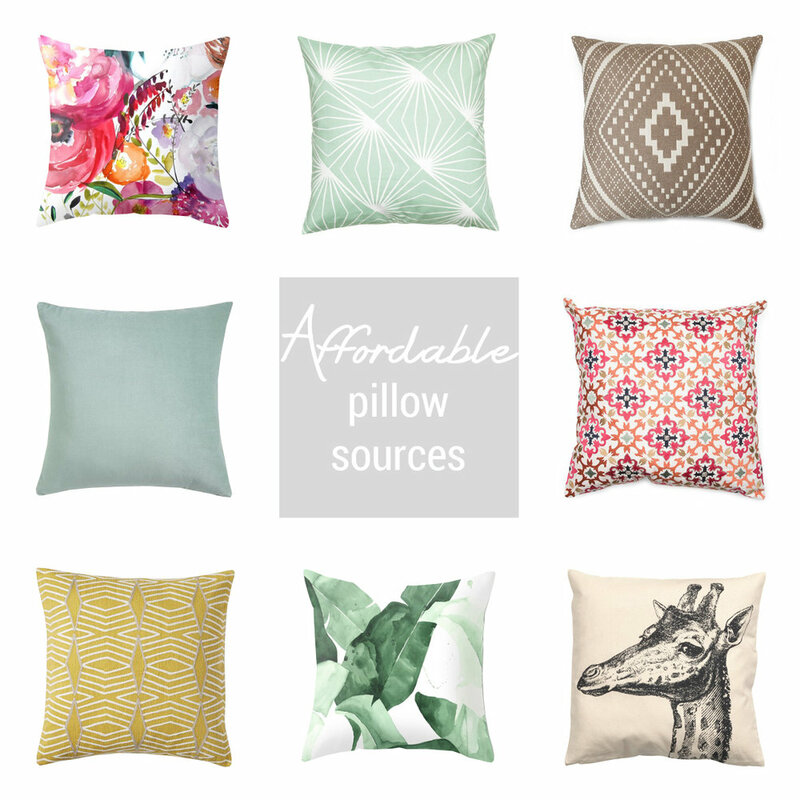 Pillow-wise, they're great for both bold batterns and textural neutrals. Honestly, I always forget that H&M has a home section. My local H&M doesn't stock home items (sadface) but I stopped in one while on vacation a little over a month ago and it seriously took all my willpower not to buy all the things. Target has a pretty extensive pillow collection both in stores and online. They've definitely been upping their decor game by leaps and bounds in the past few years and the pillows are no different. There's certainly some duds to sift through, but when they're good, they're REALLY good. While their seasonal patterns aren't making me jump for joy currently, World market has some great go to colors and textures ideal for layering. I'm lumping these together since they're the same company although only TX Maxx has an online store. This may be my #1. Sift through the generic beachy prints and geometric patterns and you're likely to find something that feels really special. Don't you just want them all? If you have any store you'd like to add to the list, please share in the comments! Share your pillow source secrets! Welcome to a new series: "Designing with..." This series is going to to all about showing you how you can incorporate challenging, bold, or offbeat elements seamlessly into your home. Stripes are such a bold design statement, but it can be a bit tricky incorporating a big stripe into a space without overpowering it. With bold stripes, the trick is to let the stripe be the star. I wouldn't recommend an entire room with bold horizontal stripes for fear of it turning into a carnival attraction, however a single focal wall with bold stripes? You got it! Choose a wall that is already a natural focal point or is a focal point due to furniture placement: behind a bed, surrounding a fireplace, or in this case, behind a desk. Draw attention to the floor without overwhelming it. To balance out a pattern-heavy floor, bring the eye up with other interest and pattern in artwork or accessories. Vary the scale so that nothing competes visually. 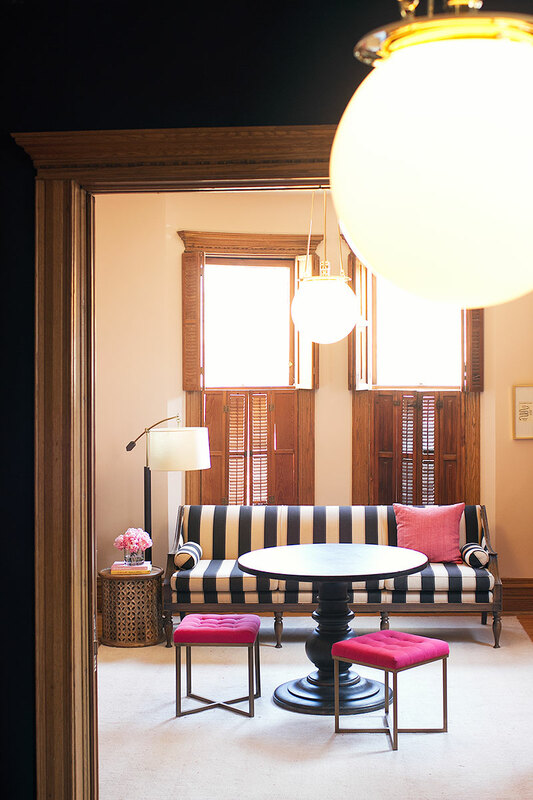 If you're feeling bold, a striped piece of furniture can be such a swoon-worthy element if done right. Plan for the piece itself to become the focal point and other ancillary pieces should be supporting players. 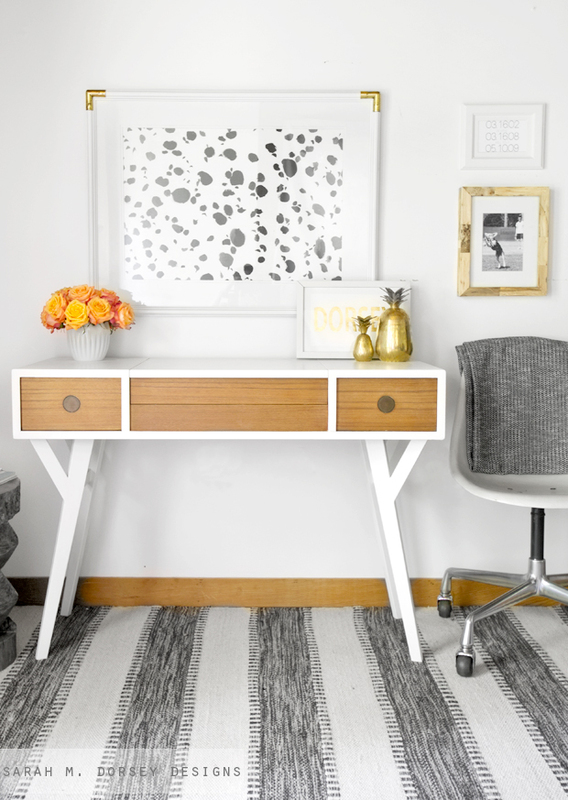 Use pops of color, smaller patterns, and organic elements to balance out the space. The striking linear quality of a stripe paired with natural elements is a match made in heaven. 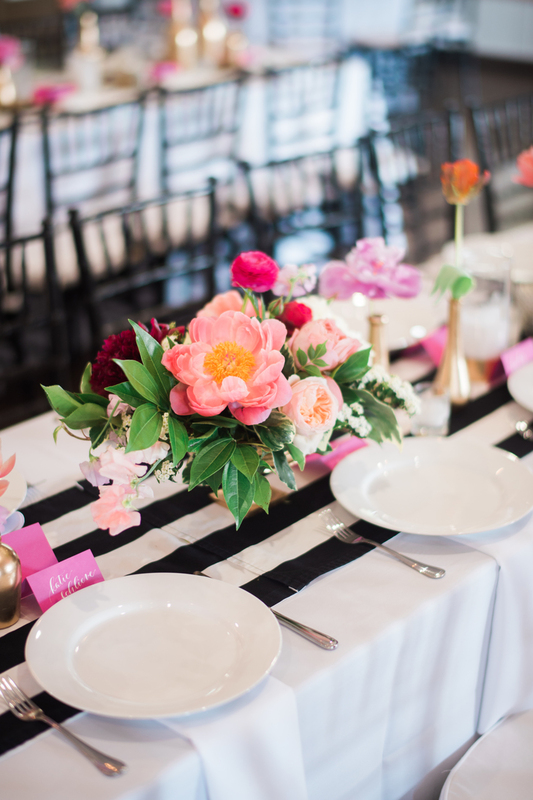 Opposites attract for a reason- the organic grouping of flowers softens the harsh lines, while the rigidity of the stripes keeps the flowers from feeling too dainty. **Design disclaimer** As with all things in design, rules are made to be broken. These guidelines are just a start, however once your stripe skills have been developed, possibilities are endless! 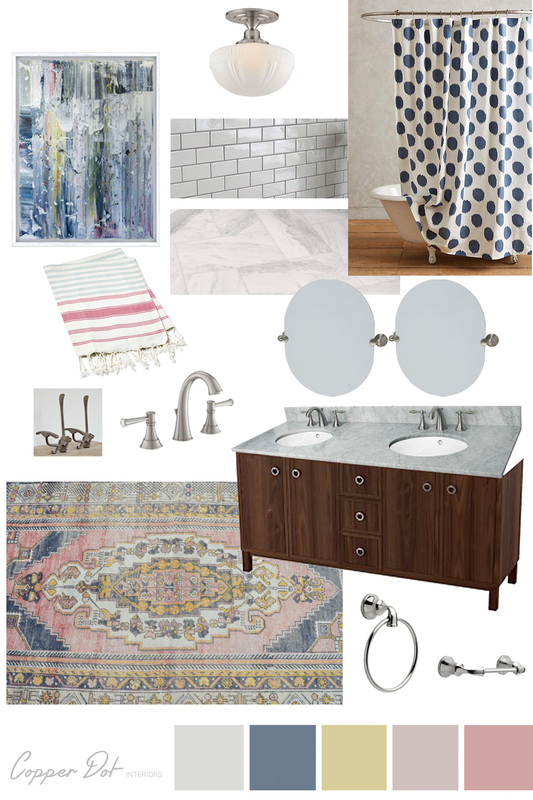 Future "Designing with..." posts will include polka dots, brass, and florals to name a few. I'd love to hear what design topics you're stumped by and would love to see in this series (or in a separate post if applicable)! The number one thing that people get stumped on in a space is colors. How do you pick colors? Where do you start? How do you make colors flow from room to room? A current color trend that I have to say that I'm on board with (and never thought I would be) is white. White or another light neutral can be an amazing backdrop to display colorful artwork, amazing furniture, or simply your quirky finds. Even with white walls, however, you still need to keep a color palate in mind for a room to ensure that it feels cohesive as a whole. One of my favorite ways to start a room design is with an inspiration piece. This could be a painting, a rug, a pillow- just something with a bit of visual interest. This gorgeous rug from Etsy (which is sadly no longer available) was the catalyst for this color scheme. Rich blues, soft pinks, and a splash of yellow. 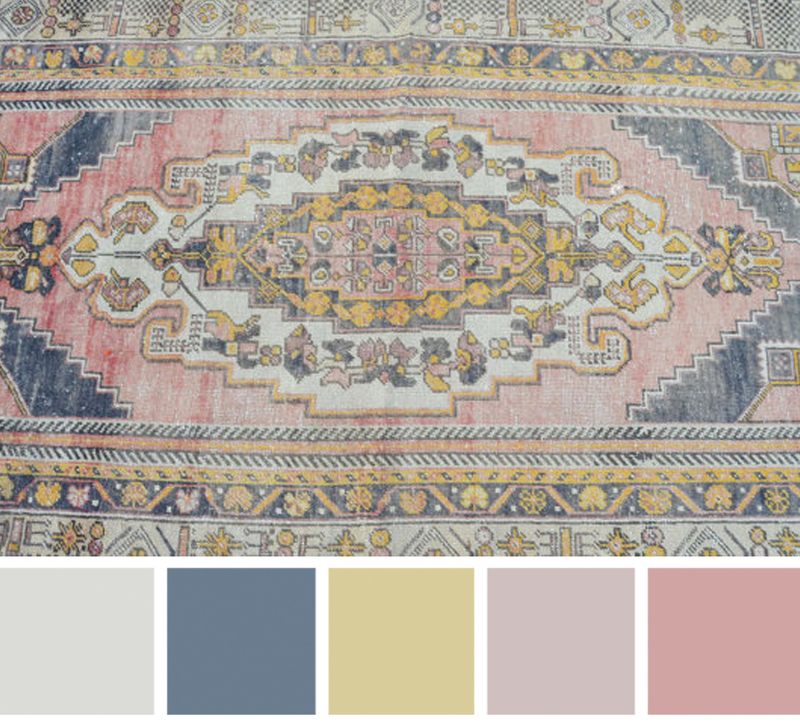 Translating that into a room environment, I would allow the tile to be classic and neutral while playing up the colors from the rug. The fun part is that you don't have to use the same value of each color- in the below space, I played with the blue a bit, bringing in a darker version with the navy in the curtain and lighter values in the painting. Color should be fun, not intimidating! True there are pretty much endless colors to pick from, but if you give yourself a palette to work within, you'll have room to play an the confidence that it'll all work together. Welcome to Copper Dot Interiors! I hope this blog inspires and empowers you to embrace design and make your home the best it can be! I strive to provide design inspiration, renovation realities, and the occasional DIY to allow you to embrace your space. Want to follow along on our House Flipping Journey? Sign up for exclusive updates and design tips from Copper Dot Interiors!